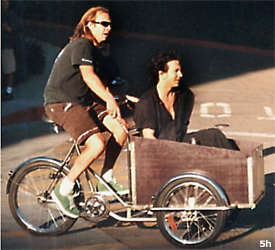 "i love to ride my bicycle"
Who says Ed is "too serious?!!!" 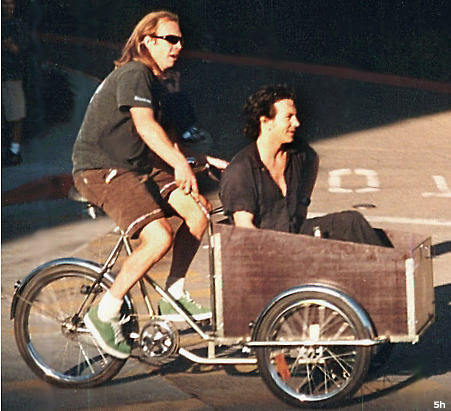 Members of Pearl Jam are frequently sighted before shows taking part in various fun & non-musical activities ... shooting a few hoops, surfing, skateboarding, playing ping pong, eating tacos (hi, Mike!) and even going for a little bike ride. This photo was captured in San Diego in 1998 .. with Ed & Jeff Ousley (Mike's guitar tech) making a beer run prior to one of the shows.